Yesterday we had a bit of a play date with a couple of girls from our antinatel group and their gorgeous babies. The boys loved playing together and the mums enjoyed chatting over coffee and chocolate chip bikkies. 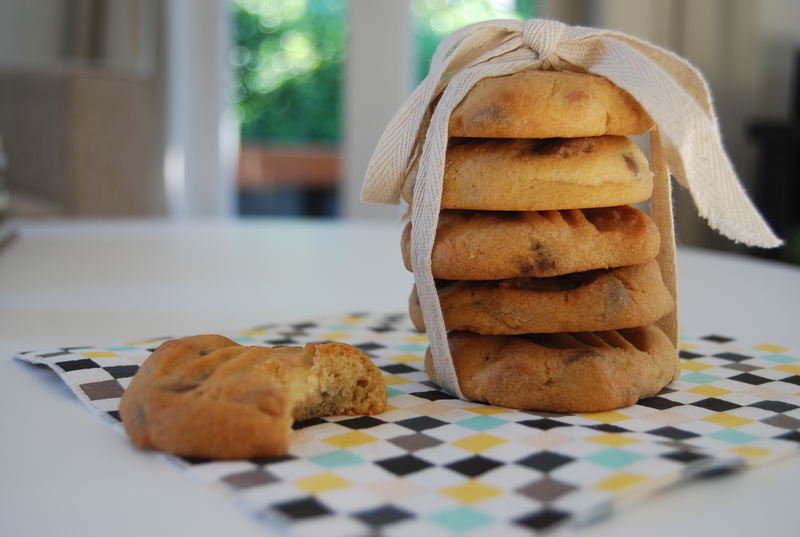 Chocolate chip biscuits are always a crowd pleaser. These ones are particularly tasty especially with the combination of milk and white chocolate. They’re quick and easy to whip up and the recipe makes a decent amount (24 – 30 depending on what size you make them). I made 18 and then rolled the rest of the mixture into a long log which I wrapped in Glad-wrap and popped in the freezer for slicing and baking at a later date. So, fancy a bit of weekend baking? Preheat oven to 180 C. Place butter and sugar in a bowl and beat together until light and creamy. Add the vanilla and egg and beat again. Stir in the flour and baking powder until just combined (it may seem like a lot of flour but just keep folding!). Fold through the chocolate chips. Place spoonfuls on a lined baking tray, allowing room to spread. Cook for 15-20 minutes until golden. Allow to cool on the tray for a few minutes before placing on a wire rack.